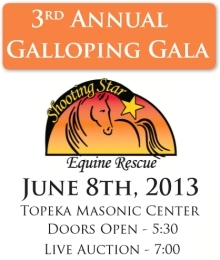 Our Horses | Shooting Star Equine Rescue, Inc. The rescue has acquired equines from local, high slaughter risk auctions in addition to taking in neglect or abuse cases from authorities or as an owner surrender. Priority is given to those coming in due to abuse or neglect situations, however, any horse falling within our mission statement to help horses is considered for placement if room is available. When the rescue is at capacity, all attempts are made to assist the horse through networking or owner support. I encourage anyone desiring a horse to also check out your local auctions and consider offering a home to a horse who may otherwise be purchased by a kill buyer and headed to slaughter. There are many sound, well broke, and beautiful horses found at auctions and heading to suffer the horrors of slaughter in Mx or Canada. Who knows~~ the life you save may be your one and only “heart horse” of your dreams. They all deserve a chance and if it wasn’t for people like you and me, they wouldn’t get it. You can be the one who makes a difference in the life of a horse. The rescue cares for up to 20 equines ( horses, ponies, donkeys and mules) at any time with varying age and training levels. Several companion only homes are needed for those equines unsound for riding but who have a lot of love to give and life to live . While we occasionally have sound, well broke for a beginner horses available for adoption~most of our horses are younger and in need of being started under saddle, are still considered “green broke”, are for the experienced rider or may be older and have some arthritis. Feel free to call or e-mail if you are looking for a particular type of horse. We may not currently have this type of horse available, but I have many networking contacts who have available horses needing homes, and I would be happy to help you find “your” special horse. Horses, donkeys and ponies of all breeds, sizes, gaited, or training levels are out there just waiting for “their” special person to offer them a chance for a good home. All horses are “placed” only after thorough contracts are completed, after home site visits are made and reference checks are approved. Shooting Star places only to local homes within the state of Ks or close proximity. Prospective new homes must visit the rescue to spend time with a potential new horse in order to assess whether they are a good fit due to temperament, experience and training level of the horse. Follow up visits are done at 1 month, 6 months and at one year after placement. Yearly updates are required after the first year. If for any reason the placement home is unable to continue to care for the horse, they must return to the rescue OR the rescue MUST approve and complete the application and approval process with any future home arranged. Because we feel a huge sense of responsibility of insuring a good home to each horse we place, we feel we want to be a safety net for each rescued horse for the remainder of his/her life. We are very thankful for anyone interested in and willing to consider providing a loving home to one of our horses and we will do all we can to help to insure a successful placement with an approved home. For a minimal fee, local training is offered through our volunteer trainer to start your chosen horse under saddle or provide additional riding time as well as to promote bonding and partnership.